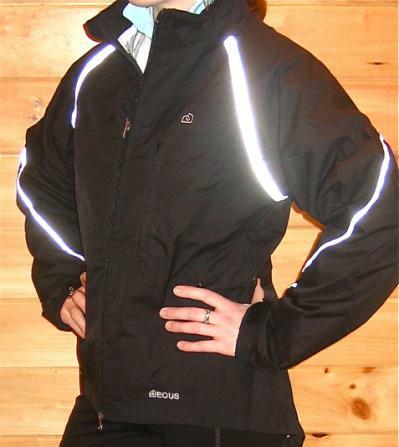 This is a beautifully cut jacket with a drop down back that keeps you warm and dry in and out of the saddle. 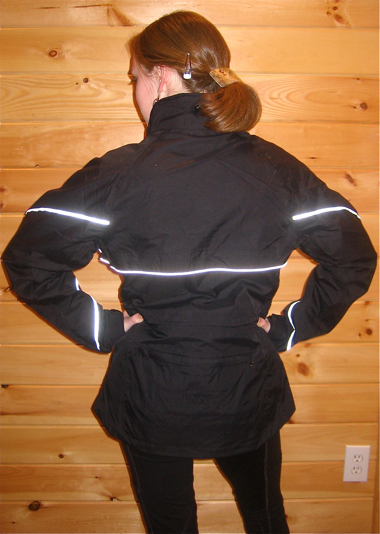 The reflective piping adds safety in the dusk and early morning light. This is very useful for the show rider who finds themselves around trailers, barns and rings in minimal light, or for the trail/endurance rider who may find themselves around traffic. The one piece zip off sleeve and upper back panel leaves a light vest with a mesh back. 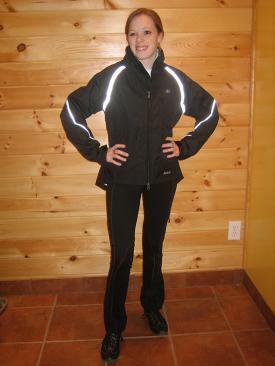 This is perfect for the middle of the training session or during your ride as the days warms up. A generous pocket in the back of the jacket affords you the opportunity to tuck the sleeves handily close by in case the weather surprises you. Super lightweight so is a good 'go to' jacket for travel. TheHorseStudio.com review. 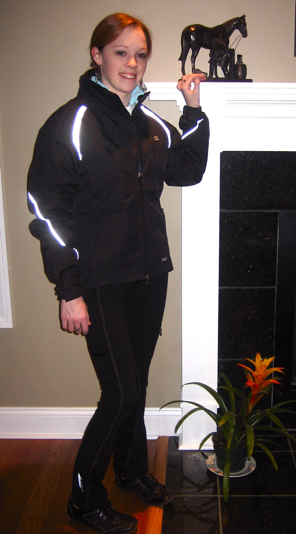 As you can see from the photos this jacket has good lines and a comfortable feel. 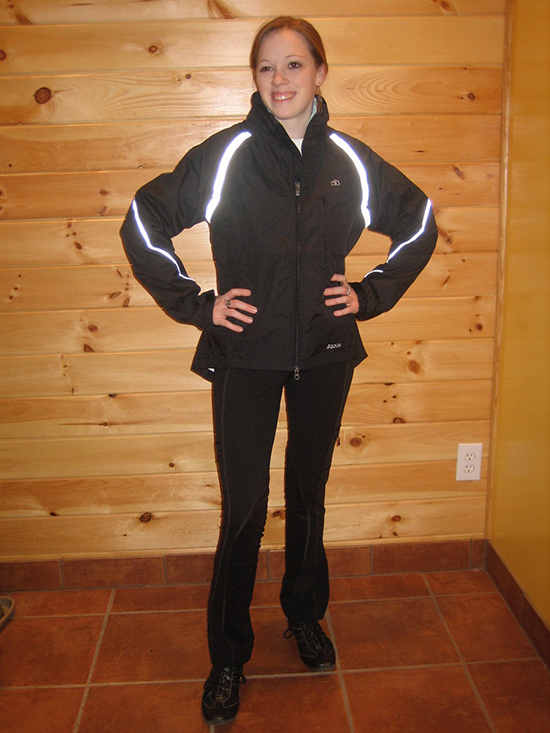 The high tech fabric is both waterproof and breathable, and the 'tail' cover keeps all of you warm and dry. There are lots of handy pockets. Both a vertical chest pocket and front pockets and importantly they all zip securely. For those that love it there is a drawstring waist and the cuffs are adjustable for the perfect fit. As I do a fair amount of long distance riding, I bought the reflective grey piping bridle 'The Munster', to go with this jacket that is also sold here at TheHorseStudio.com. It's a safety blessing for both my horse and myself. Also shown in the photo here are the black riding pants with boot cut. They are very easy on and off and good for quick changes on the road and also pack well as both jacket and pants (sold out) are so lightweight making them perfect for trips. I also recommend the FITS pull on breeches for long distance riding comfort and long trail rides or riding multiple horses in one day. This jacket is washable, breathable and waterproof. Lining is Polyester. Outer: Nylon Dobby.